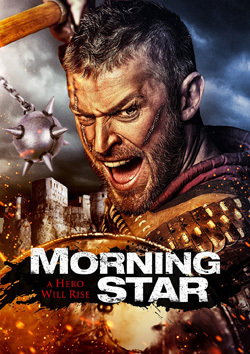 There have been a few attempts to revisit the peplum – or to be more accurate the historical adventure film – in Italy over recent years and Morning Star, which was released to little fanfare in 2014, is one of the more idiosyncratic. Directed by Luca Boni and Marco Ristori, who are better known for their moderately successful zombie movies (Eaters (2011), Apocalypse Z (2013), Reich of the Dead (2015)), it’s as much a metaphysical rumination on the nature of guilt as much as an action movie, which probably explains why most comments on the IMDB are of a negative inclination: this is not something you’ll enjoy if you’re expecting Ironclad or The Hobbit. For me, though, despite its many flaws it’s by some distance the most interesting thing the dual directors have done to date. 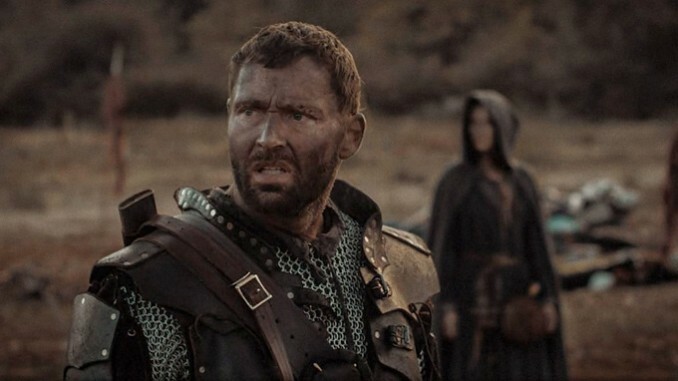 A knight (Adrian Bouchet) survives a bloody battle but his best – and only – friend (Daniel Vivian) doesn’t. Under directions from a mysterious woman who is scavenging among the dead (Ivy Corbin), he wraps up the body, constructs a rudimentary cart and sets about dragging it back to the home they left over ten years earlier. On the way he encounters an old crone who lives in a swamp, several homicidal soldiers, a dissipated King who controls some phantom bodyguards and the woman from the battle-yard (repeatedly). In the meantime he is gradually starving and haunted by memories of a red haired woman who has something to do with the reason for his running away and becoming a soldier in the first place. It’s fair to say that there’s not a great deal of plot in this, which isn’t necessarily a bad thing. Instead its a traditional quest story which is stripped down to the bare minimum and then given a supernatural slant. As such it has a lot more in common with back-to-basics, weird adventure films like Excalibur, The Navigator, Valhalla Rising and A Field in England, with which is shares a sense of oppressive mood, a taste for surreal visuals, a rather circular narrative and an interest in the dirt and deprivation of life in the past. From Italian cinema, there are obvious nods to the Spaghetti Western, with the corpse-dragging Knight recalling the protagonist of Django and the mysterious scavenging woman / witch filling a similar role to the identical character in Enzo Castellari’s Keoma. According to IMDB, the budget was $3 million, which seems a lot and, to be honest, it would have worked just as well if made for less. The big action scenes can’t compare to those of better funded productions, whereas the lower key elements work much better (the opening battle. for instance, is rather tedious, while the shots of it’s aftermath are rather haunting). Boni and Ristori find some striking locations and give it a distinctive visual look, although it does have the same deliberately over-exposed cinematography as their other work. The acting is variable: Bouchet – who has recently had a decent part in the TV series The Last Kingdom – is fine but some of the supporting performers, most of whom have a background in stunts, put in erratic turns.